Thrombolysis in its simplest terms means the enzymic breakdown of fibrin which forms the structure of an occlusive thrombus which then allows reperfusion. However unlike myocardial cells brain cells tolerate hypoxia and ischaemia far less and cell death occurs within minutes if flow falls below critical. Thrombolysis can never stop strokes or prevent infarction as cell death occurs very quickly within minutes but the idea is to reduce stroke size based on the concept of the ischaemic penumbra which is the volume of brain tissue that exists around the core infarct which exists between cell death and cell recovery and which can be rescued if reperfusion occurs. Alteplase (Actilyse) is currently the only drug licensed to treat Acute Stroke. Actilyse is a plasminogen activator. Once activated plamsinogen converts to plamsin and enzymically breaks down fibrin. Unlike with cardiac thrombolysis streptokinase has been found to be harmful in any study involving acute stroke. Other trials are looking at newer forms of t-PA but currently Alteplase is the only choice. In the light of the success of the use of thrombolysis in reducing mortality in cardiovascular trials in ST-elevation MI (and its dramatic lack of effect in NSTEMI)it was thought that a similar therapeutic benefit might be had with acute ischaemic stroke. Initial trials in stroke however were dramatically unsuccessful. This involved Streptokinase which in STEMIs was almost as good as Alteplase. It wasn't until NINDS trial that things took off and Alteplase was rapidly given FDA approval for use. Thrombolytic therapy for acute ischaemic stroke up until the NINDS study had been approached cautiously because there were high rates of intracerebral haemorrhage in early clinical trials. In the NINDS study a randomised, double-blind trial of intravenous recombinant tissue plasminogen activator (t-PA) for ischaemic stroke was begun within three hours of the onset of stroke. The trial had two parts. Part 1 (in which 291 patients were enrolled) tested whether t-PA had clinical activity, as indicated by an improvement of 4 points over base-line values in the score of the National Institutes of Health stroke scale (NIHSS) or the resolution of the neurologic deficit within 24 hours of the onset of stroke. Part 2 (in which 333 patients were enrolled) used a global test statistic to assess clinical outcome at three months, according to scores on the Barthel index, modified Rankin scale, Glasgow outcome scale, and NIHSS. In part 1, there was no significant difference between the group given t-PA and that given placebo in the percentages of patients with neurological improvement at 24 hours, although a benefit was observed for the t-PA group at three months for all four outcome measures. 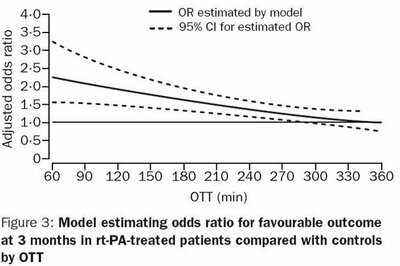 In part 2, the long-term clinical benefit of t-PA predicted by the results of part 1 was confirmed (global odds ratio for a favourable outcome, 1.7; 95 per cent confidence interval, 1.2 to 2.6). As compared with patients given placebo, patients treated with t-PA were at least 30 per cent more likely to have minimal or no disability at three months on the assessment scales. Symptomatic intracerebral haemorrhage within 36 hours after the onset of stroke occurred in 6.4 per cent of patients given t-PA but only 0.6 per cent of patients given placebo (P <0.001). Mortality at three months was 17 per cent in the t-PA group and 21 per cent in the placebo group (P = 0.30). 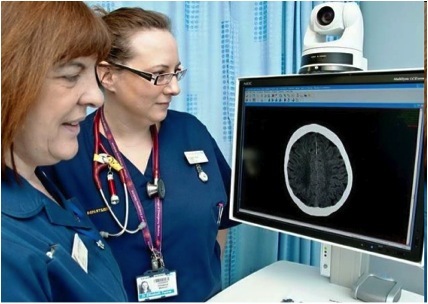 In acute ischaemic stroke alteplase is licensed subject to use in an appropriate clinical environment by a physician trained and experienced in neurological care. Treatment units must be registered with SITS-MOST (Safe Implementation of Thrombolysis in Stroke Monitoring System), an on-line database established in Sweden to collect information on patient outcomes when alteplase is used in routine practice. Those thrombolysed outside the 3-hour window are done off license a point that should be made clear. ECASS (European Cooperative Acute Stroke Study) involved 620 patients given 1.1 mg/kg of Alteplase or placebo within 6 hours. Outcome showed a small benefit for those treated with alteplase but at the cost of extra early deaths. ECASS 2 (European Cooperative Acute Stroke Study) randomised 820 patients to Alteplase 0.9 mg/kg or placebo. Strokes were less severe than ECASS. There was a very small benefit for thrombolysed patients. In 2002 the ATLANTIS data was released on patients treated with alteplase within 3 hours of stroke onset. In total 61 patients enrolled in the Alteplase Thrombolysis for Acute Non-interventional Therapy in Ischaemic Stroke (ATLANTIS) study randomised to receive intravenous tPA or placebo within 3 hours of symptom onset. Despite a significant increase in the rate of symptomatic intracranial haemorrhage, tPA-treated patients were more likely to have a very favourable outcome (score of < or = 1) on the National Institutes of Health Stroke Scale at 90 days (P=0.01). These data supported the NINDS based recommendations to administer intravenous tPA to eligible ischaemic stroke patients who can be treated within 3 hours of symptom onset. More positive evidence for the benefits of thrombolysis came out in the ECASS 3 trial in 2008 which extended the window beyond 3 hours to 4.5 hours after onset of stroke. Patients again were given alteplase after exclusion of brain haemorrhage or major infarction, as detected on a CT. Patients were randomly assigned in a 1:1 double-blind fashion to receive treatment with intravenous alteplase (0.9 mg per kilogram of body weight) or placebo. The primary endpoint was disability at 90 days, dichotomized as a favourable outcome (a score of 0 or 1 on the modified Rankin scale, which has a range of 0 to 6, with 0 indicating no symptoms at all and 6 indicating death) or an unfavourable outcome (a score of 2 to 6 on the modified Rankin scale). The secondary endpoint was a global outcome analysis of four neurologic and disability scores combined. Safety endpoints included death, symptomatic intracranial haemorrhage, and other serious adverse events.. In total 821 patients were enrolled in the study and randomly assigned 418 to the alteplase group and 403 to the placebo group. The median time for the administration of alteplase was 3 hours 59 minutes. More patients had a favourable outcome with alteplase than with placebo (52.4% vs. 45.2%; odds ratio, 1.34; 95% confidence interval [CI], 1.02 to 1.76; P=0.04). In the global analysis, the outcome was also improved with alteplase as compared with placebo (odds ratio, 1.28; 95% CI, 1.00 to 1.65; P<0.05). The incidence of intracranial haemorrhage was higher with alteplase than with placebo (for any intracranial haemorrhage, 27.0% vs. 17.6%; P=0.001; for symptomatic intracranial haemorrhage, 2.4% vs. 0.2%; P=0.008). Mortality did not differ significantly between the alteplase and placebo groups (7.7% and 8.4%, respectively; P=0.68). There was no significant difference in the rate of other serious adverse events. As compared with placebo, intravenous alteplase administered between 3 and 4.5 hours after the onset of symptoms significantly improved clinical outcomes in patients with acute ischaemic stroke; alteplase was more frequently associated with symptomatic intracranial haemorrhage. Again alteplase did not alter mortality but did improve outcome. In terms of effectiveness this has been looked at. Analysis post-ECASS 3 showed that treatment with tissue plasminogen activator in the 3- to 4.5-hour window confers benefit on approximately half as many patients as treatment < 3 hours, with no increase in the conferral of harm. Approximately 1 in 6 patients has a better and 1 in 35 has a worse outcome as a result of therapy. We are currently awaiting the results of the IST 3 trial which again has pushed the limits to those over the age of 80 and beyond the 3-hour mark. The graph above shows a clear fall off in benefit with time. One can separate patients into different cohorts - the first 90 minutes when benefits are maximal so one may be keener to treat, the 90-180 minutes where there are still gains and the final 180 mins out to 270 minutes where benefits are rapidly diminishing and so the risk should be reduced commensurately. This data has only been available since May 2012. This randomised control trial data has shown that it is safe to treat older people. The third International Stroke Trial (IST-3) sought to determine whether a wider range of patients might benefit up to 6 h from stroke onset. For the types of patient recruited in IST-3, despite the early hazards, thrombolysis within 6 h improved functional outcome. Benefit did not seem to be diminished in elderly patients. For every 1000 patients given rt-PA within three hours of a stroke, 80 more will survive and live without help from others than if they had not been given the drug. There is an early risk of death in the first week due to symptomatic intracranial haemorrhage. Consenting patients for thrombolysis can be difficult. Benefits are constantly falling rapidly with time. The risk of symptomatic ICH is small but real about 5-6%. There are also risks of other complications although rare. Patients are often dysphasic or if not dysphasic are anxious and in a strange and frightening environment. they have just been brought in, had a CT scan and most have no idea what a stroke is. It is really not an environment that one should ever be asked to make a personal decision. One would never make a life-changing decision with so little knowledge or time. It is hard to regard the consenting process as being fully informed as the patient is in no state really to take in and process information. However, time is not available for the patient to take long to consider the risks and benefits. Most patients have seen the adverts on the TV and there is an inherent trust in that that certainly helps the patient to accept the treatment. It must be made clear that there are real risks and the treatment may lead to disability and death but that it is more likely to reduce these. Where the patient is not able to consent such as due to severe dysphasia then one must act in the best interests of the patient. If the family are available it is wise to get them on side and explain to them what is happening but they have no real legal standing unless they hold a lasting power of attorney to manage the patient's affairs when they become incapacitated. Family can, however, communicate the patients’ views if any have been expressed before - a sort of decision by proxy. There is a symptomatic bleed risk of about 5% however that is not associated with increased mortality in those receiving thrombolysis. The most recent data suggest that treating 100 patients will result in an additional 8 people being alive or with minimal disability than would otherwise be. Generally with thrombolysis most of us accept verbal consent as that is quicker. Where consent is not possible due to a communication issue e.g. dysphasic patient then the doctor may act in the patients best interests. This is not to give the doctor the right to override a patients decision which the doctor may regard as unwise. The medical professional must act sensibly and with the patient's best interests foremost and should certainly be able to justify their actions to a court, or their lack of action. A patient may later challenge a decision in which they were denied treatment. Ultimately the responsibility rests on the consultant in charge. A very user-friendly proforma makes the process safer and faster. Go through it line by line. Before giving Alteplase check that..
Do not proceed with thrombolysis assessment if any of the above answers are YES - take advice if unsure. Microbleeds In otherwise eligible patients who have had a previously demonstrated small number (1-10) of CMBs on MRI, administration of IV alteplase is reasonable. In otherwise eligible patients who have had a previously demonstrated high burden of CMBs (>10) on MRI, treatment with IV alteplase may be associated with an increased risk of sICH, and the benefits of treatment are uncertain. Treatment may be reasonable if there is the potential for substantial benefit. Sickle cell IV alteplase for adults presenting with an AIS with known sickle cell disease can be beneficial. LMWH IV alteplase should not be administered to patients who have received a treatment dose of low-molecular-weight heparin (LMWH) within the previous 24 hours. Do not proceed with thrombolysis assessment if any of the above answers are NO - take advice if unsure. Blood pressure must be below 185/110 mm Hg for thrombolysis and maintained below that level for the first 12 hours. If over 185/110. BP may be treated with a nitrate patch or nitroglycerin paste and/or one or two 10-20 mg doses of LABETALOL given IV push within one hour. Practically if the patient can take a beta blocker I prefer the ease of giving Labetalol.If these measures do not reduce BP below 185/110 and keep it down, the patient should not be treated with rt-PA.
Do not proceed with thrombolysis if any of the above answers are NO - take advice if unsure. Alteplase comes as a vial with powder and water for reconstitution and diluent. Please see the body-weight chart in the appendix of this policy. ALTEPLASE Total dose: 0.9mg/kg. MAXIMUM DOSE IS 90 MG. Should be prescribed by and administration supervised by a doctor (Registrar or above) once the approval has been obtained from the Stroke consultant. Give 10% of total dose given as an IV push over 2 minutes. Give remaining 90% of dose IV over 60 minutes via infusion pump. Nasogastric tube unless absolutely necessary. Patients must be continuously monitored following Alteplase and for at least 24 hours following administration for potential side effects and complications. Good blood pressure control is required post-thrombolysis to reduce the potential risk of haemorrhagic transformation. It is vital to reduce it carefully to below the threshold of 185/110 mmHg. Do not strive for a normal BP. Rapid reductions in blood pressure can reduce brain perfusion and worsen outcome. The normal cerebral autoregulation of blood flow is impaired during the acute stroke and blood flow can be greatly affected by rapid systemic changes. Every 15 minutes for 2 hours after starting the infusion. Every hour for 18 hours. If BP > 185/110 mmHg first check for usual causes e.g. pain, urinary retention. Consider either IV labetolol 20 mg over 1 to 2 minutes.The dose may be repeated and/or doubled every 10 minutes. A dose of up to 150 mg may be given. IV Sodium Nitroprusside (0.5 to 10 mg/kg/min). Nitrate patches may be used. May be combined with oral therapy such as Amlodipine 5 mg stat dose. Use local protocols.In all cases continue agent until BP < 185/110 mmHg is reached. Monitor blood pressure every 15 minutes during the antihypertensive therapy. Keep BP safely below 185/110 mmHg during and after thrombolysis. This needs actively and continuously managed. Acute Anaphylaxis Suspect an anaphylactic reaction if the patient develops: rash. urticaria. bronchospasm, orolingual angioedema (face. lips and tongue swelling alone) hypotension, stridor, shock. Stop ALTEPLASE. Urgent medical assessment - airway. breathing and circulation. Adrenaline (EPINEPHRINE) 0.5-1 ml 1 in 1000 im or sc NOT iv if anaphylaxis (dose depends on severity of reaction - (Adrenaline is not usually required if isolated orolingual angioedema. This is commoner in those on an ACEI). 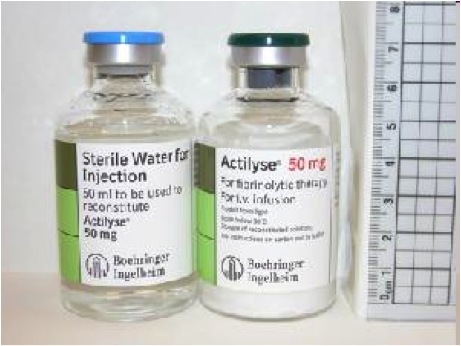 HYDROCORTISONE 200mg iv. CHLORPHENAMINE 10mg iv. Fluid challenge with IV N-Saline if shocked and consider repeat doses of Adrenaline [US EPINEPHRINE] as required. Involve anaesthetist immediately if orolingual angioedema is threatening airway. Comments from the ALTEPLASE datasheet - take haematology advice If a potentially dangerous haemorrhage occurs in particular cerebral haemorrhage. The fibrinolytic therapy must be discontinued. In general. however. it is not necessary to replace the coagulation factors because of the short half-life and the minimal effect on the systemic coagulation factors. 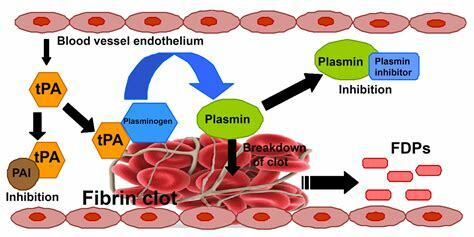 Most patients who have bleeding can be managed by interruption of thrombolytic and anticoagulant therapy. volume replacement. and manual pressure applied to an incompetent vessel. Protamine should be considered if heparin has been administered within 4 hours of the onset of bleeding. In the few patients who fail to respond to these conservative measures. judicious use of transfusion products may be indicated. Transfusion of cryoprecipitate. fresh frozen plasma. and platelets should be considered with clinical and laboratory reassessment after each administration. A target fibrinogen level of 1 g/l is desirable with cryoprecipitate infusion. Those who do best with thrombolysis are those treated within the first 90 minutes of stroke. After that is a typical decay curve in terms of ongoing gain until it reaches no gain at about 4.5 hours. The fact that patients can be treated out to this time is no excuse whatsoever for any delays in arrival, assessment, scanning and treatment. It is vital that times are audited for all cases and action plans and indeed root cause analysis for any significant delays or breaches. Certainly a door to needle time of 1 hour should be the limit and 45 minutes the ideal target to allow proper assessment and scanning. If unsure what to do then it is better to take advice from someone more experienced so a decision can be made. Would also caution against assuming that it is a TIA and is getting better unless there is complete resolution within 10-20 minutes. Anything longer then assess and treat as stroke. It was agreed that all thrombolysis given should be registered on an international SITS database based in Stockholm. Stroke units in the UK should adhere to this and also thrombolysis is recorded on the SSNAP database. This records age, stroke type and the occurrence of any secondary haemorrhage. It is useful for all centres to record this data and al stroke centres should be auditing their rates of thrombolysis, doing analysis if those who have delayed lysis and looking at those who failed to be given lysis without a clear contraindication at frequent M&M meetings as part of good clinical governance. Röther J1, Ford GA, Thijs VN. Cerebrovasc Dis. 2013;35(4):313-9. Thrombolytics in acute ischaemic stroke: historical perspective and future opportunities.